Over on DQYDJ in a recent article The Great Recession’s Effect on the Number of Men and Women in the Workforce, PK said : "At this pace, (I recognize the dangers of extrapolation, but follow me here) we’re going to see parity reached in a generation… with both sexes sending less than 60% of their populations into the workforce." I agreed with the idea that at this pace we'll hit equal rates between men and women before too long. However I assumed it would be over 60% per gender. To test the extrapolation I thought I'd just project the rates for men & women into the next couple decades. Thats not hard to do really. I got the data on the employment ratio from the BLS per gender going from 1949 to 2013. For simplicity I just plotted the Q1 figures. I then projected those trends forward until the year 2027 to see how the plot line would extrapolate into the future. 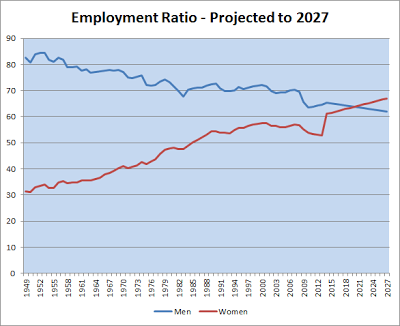 If the current trends continued then we'd see the % of women employment ratio exceed the men in the year 2021. Keep in mind that the figures after 2013 are just projections. Of course the trends could change in the future and something like another recession could throw things out of whack as well. 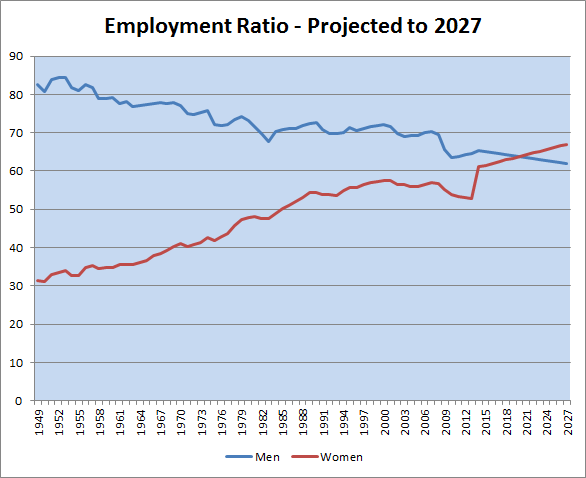 At this rate we'll see higher % of women working than men by 2021. Thats less than 10 years in the future.